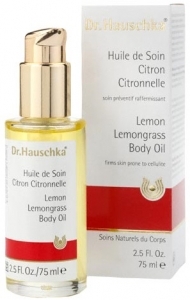 I first used this oil many years ago on a shoot in Germany – the makeup artist massaged it into my arms and legs to give them a nice sheen and I remember that the lemon scent remained uplifting and energising throughout what turned out to be a very long and difficult day. I didn’t realise until very recently (like, today) that this oil is intended to actually diminish the appearance of cellulite. To be perfectly honest, I think that most body oils are great for helping to diminish signs of cellulite due to the fact that they take a fair bit of effort to massage in and the more you massage and pummel, the more you’re likely to see some results. I’d massage this oil in straight after a bath or shower, whilst the skin is still very slightly damp and warm. What I quite like to do is oil myself up (ooh er missus!) and wrap myself in a load of towels before going off to do something relaxing. (I’ll be honest: it’s usually a spot of online retail therapy!) I’m positive that the warmth gives body oils a little extra boost – and it makes your towels smell lovely! At the moment, the Lemongrass Body Oil comes with a special paper sleeve that’s implanted with lemon mint plant seeds so that you can ‘grow your own’ lemon mint! I quite like lemon mint as a tea, but you can also use it to jazz up salads – it’s supposedly very good for you. Regardless of health benefits, it’s always quite a sense of achievement to see something grow from seed; I once got carried away growing tomatoes and ended up with eighteen enormous tomato plants spreading their furry spider stems all over the place. Ugh. Lemon mint should be far more tame! Full instructions are on the sleeve, which will simply biodegrade into the soil.